Rev. Gardner Taylor '40 spoke calmly into the telephone as doctors, nurses, and friends drifted in and out of his hospital room last August. He was nursing a bum knee, and although the injury was considered minor, it had left the 85-year-old preacher trapped in Brooklyn, N.Y., which meant canceling speaking engagements until October. This was a slight reprieve, given that the man hailed as "the dean of the nation's black preachers" was booked until July 2004. "One doesn't live up to a statement like that," Taylor explained when asked about the 1980 TIME magazine notation that follows him to this day. "It's just a phrase that people use. One would have to know every African American preacher in the world to come to that sort of conclusion." What we do know is that after Taylor graduated from Oberlin's School of Theology, he embarked on a 50-year career that took him through the fields of the Civil Rights movement alongside friend Dr. Martin Luther King, Jr. He become the first African American president of the New York City chapter of the Council of Churches and, for 42 years, pastored the Concord Baptist Church of Christ in New York, developing relationships with the likes of Albert Einstein and every Democratic president since Harry S. Truman. Along the way he collected numerous honorary doctorates and distinguished awards, including the government's highest civilian award, the Medal of Freedom, presented in 2000 by President Clinton. Today, younger generations can hear Taylor's notable sermons with the 2001 release of The Words of Gardner Taylor, Volume 6: 50 Years of Timeless Treasures. Compiled by Edward L. Taylor (no relation), the six-volume set includes sermons from church events, meetings, and special occasions, as well as selected lectures, interviews, and articles. 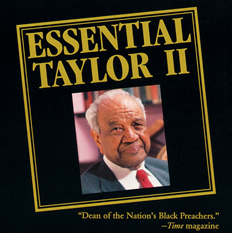 Known for his eloquence, passion, and astounding vocabulary, Taylor and his legendary preaching style have been analyzed in religious magazines and books. "His life's work has been a sermon as well, teaching that none live in dignity when they are oppressed, and that faith can transcend racial, social, and economic boundaries," President Clinton noted in his citation to Taylor. Today, Taylor continues to confront the challenges facing minorities and holds a particular interest in problems facing young ministers. "So much has changed," he says. "Even worship patterns have changed. There is a gap between young and old, and pastors must be sensitive to this. I enjoy being a mentor, and I'll encourage anyone who needs it." As Gardner said to a Memphis, Tenn., reporter in 2001: "One must get out of life and into the Bible, but there are also times when one must get out of the Bible and into life." At age 85, this "poet laureate of American Protestantism" is doing just that, and with no signs of slowing down.